Whether you give your children an allowance or not, there are advantages and disadvantages to doing so. Here is a look at both sides of the allowance debate as well as what we do in our home. Children learn money management skills in a safe environment. Learning to budget at an early age is a very important life skill. This is especially true in our current culture where it is easier than ever to “charge it” and worry about the consequences later. Learning how to save up for larger purchases, think twice about making an impulse buy, and comparison shop are skills that will benefit your children for decades to come. The cost of a mistake is lower when your child is younger, and he is considering whether to purchase a toy or go to the movies, than when he is older and must decide between going out to eat or saving for a large purchase such as buying a home or paying off student loans. Children learn to be generous and tithe. I have heard many people in church talk about how difficult it was to begin tithing. It was not in their budget of mostly fixed expenses so they had to start small and slowly increase the amount they gave to the church each year. I am very thankful that my parents encouraged the practice of tithing very early. I began working at my dad’s accounting business in kindergarten and my parents taught me to tithe off my earnings even then. My mother-in-law also encouraged my husband to tithe. So when we married and set up our first budget, we tithed from the beginning. Children gain experience handling money. If children have a bank account, they will learn how to deposit and withdraw money from the bank. We have had several bank tellers comment how glad they are to see my girls practice filling out a deposit slip to deposit their money. They have quite a few adults come who do not know how to fill out a deposit slip. Children also gain experience with the concept that the bank is keeping their money in a safe place, but the money is available to them when they need or want it. Along the same lines, they can only withdraw an amount of money equal to what they deposited. This will be important when they have their first credit card and need to know not to spend more than they earn. It is easier to not buy additional things for your children. Children always seem to want more, more, more. If your children receive an allowance, they can save up to purchase some of those additional toys, games, and books that they really want. You do not have to feel bad telling them no. And because they have a limited amount of money, they will have to choose carefully what they really want to purchase. Children develop an attitude of entitlement. If they do not see the connection between contributing to the family and their allowance, they may development an attitude of entitlement. There are ways to overcome this and every family approaches it differently. Some families track that chores are completed and only pay if all chores have been completed for the week. Others pay for each chore completed. We expect our children to help with the household chores without pay. This is considered being a part of the family. We do pay them for completing extra chores around the house such as cleaning out the garage, weeding, or helping out with other household tasks as they come up. Instead of paying a specific amount for each chore, we made it simple and pay them by the hour. Children may make a poor choice when spending their money. It is true that children may make a poor choice when choosing how to spend their money. But this is part of the learning process that is valuable to learn now when the cost of a mistake is less. It is difficult for large families or families with a small budget. It can be difficult to find extra money to give children an allowance when your budget is already tight. If you decide you want to give your children an allowance, you may need to be creative to find a way to make it happen. As you probably already know, each family needs to decide if it is best for their family to give their children an allowance and how they want to implement it. 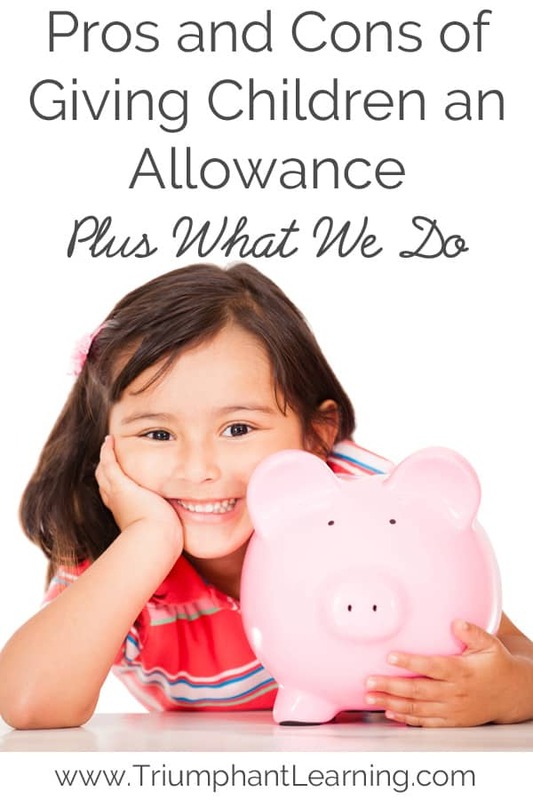 Listed below is how we chose to implement an allowance for our children. By no means am I saying you should do this in the same manner, but want to provide some ideas to help you start thinking about it. We began by giving our children an allowance of $1 per week at age five. This amount was chosen because it was small, yet it was easy to give them ten dimes and teach them the concept of tithing 10% to the church. You could just as easily choose to give $.10 per week or $1 per month if that is a better fit for your family. As our children matured, we increased the amount they receive to $10 per month. Again, the amount was chosen because it was small and easy to reinforce tithing. We moved to a monthly payout because it was easier for me to implement. We will probably keep this amount the same through high school. We expect them to contribute around the house. They have assigned daily and weekly chores as well as being expected to help willingly when requested. Occasionally, if they help with a particularly large chore, I will pay them after the fact if they had a good attitude about helping. I do not do this all of the time so they do not expect it. They are able to earn additional money by completing chores that are not assigned to them. Examples include sweeping out the garage and weeding. For simplicity, we pay for each hour worked. On allowance day, they immediately separate their money into three envelopes: donate, save, spend. If they want to save for a specific item, they will often make an additional envelope to start saving up. When they have more than $30 in their spend and save envelopes or receive money gifts for their birthday, they deposit that money into their bank account. They are expected to purchase gifts for each other for birthdays and Christmas with their money. Do you give your children an allowance? We’d love to hear why or why not. I agree that each family should decide on this issue based on the situations. We chose to give small allowances each week, beginning in kindergarten, and it increased $.25 each year through eighth grade. From ninth grade on, we gave a monthly allowance. It included enough money for their clothes, as well as discretionary spending and offerings. The first few months they spent most of their money in the first week or two, and had to scrimp or borrow from friends. They knew not to ask us for more. It was rewarding to see them learn to save and make decisions about what they wanted versus what they needed. Also, they could choose to buy expensive clothes or shoes, but they soon learned that less expensive clothes are just as good, and they could buy more of those. It was hard to not hand them more money when they would come and ask or plead their cases, but the real world doesn’t just hand out more money, so it was a great lesson. Thank you for sharing this perspective of an allowance with older children. I would like to eventually include money for their clothes as well. We’re a few years from that yet. I also like that your kids learned how to budget a monthly income. What an important skill for them to learn! We struggled with giving an allowance versus earning money for work. Our main concern was that our daughters may view their duties around the house as work that deserves pay rather than their contribution to the household so that it can function well. Also, we did not want them to have the option to say, “I don’t need the money right now, so I’m not going to do that chore or duty.” We finally found small jobs that we feel comfortable paying them to do and are slowly adding new aspects to this “job.” The job is that our girls do the shredding and recycling. They get 10c for each item they shred or recycle (a container and its lid count as one item, not two). They take turns dividing the shredding and recycling into two piles (if there is a remainder, whoever did the dividing gets the remainder) and both jobs are usually done at once. One girl divides the shredding while the other divides the recycling and they do their portion, then switch to do their portion of the other job. We have a white board where they record what they have earned – whoever divided the shredding writes the amount in both her and her sister’s column and vice versa. When payday comes (I wish this were a regular day, but it is typically when they have something they want to buy or the board is full! ), they add up the money in their columns for their total earnings. We have a little bag into which they put their tithe and they have a savings piggy bank and a spending piggy bank into which they put their respective proportions. To make it easy, 10% is giving, 40% is savings and 50% is spending. Up till now, the piles of shredding and recycling build up and they wait until I say that it is time to do recycling and shredding. The next stage that I’m implementing now is that there is a deadline for doing these jobs and if it isn’t done, I do it and they won’t have the opportunity to earn that money. I’m working hard to have a place in our schedule for them to do these jobs so that it is tied to something concrete (it will tied to a routine that we already have). Right now, I’ll give a couple of hours before the deadline; for example, the recycling and shredding need to be done before supper or before we leave for ballet lessons. The math practice adding the money and doing the proportions for giving, saving, and spending have been wonderful learning opportunities. Their mental math has improved a lot. I struggle with this. Right now, we give each of our two boys $5 every two weeks. I get in from the bank in quarters and use it over the next two weeks to “fine” them for not picking up toys, leaving clothes on the floor, etc. Whatever is left after the two weeks is theirs to keep. Also from this, they take money for church. We don’t tie this money to chores, though this past spring I paid them each $3 to pick up the yard after the snow melted; we have two dogs. 🙂 Money very, very well spent! Crystal, do the girls have separate spend and save bank accounts? How do those categories differ?